Toe strap embellished with white beads and clear rhinestones. Padded insoles, rubber soles show very little wear, 1/2" rubber heels. A couple glue over-runs on the bead settings (manufacturer defect) and a scuff or two, otherwise Excellent like new pre-owned condition. Location: Shoe Shelf 05-02-13. Ensure it is exactly what you want. You can expect a response within 12 hours or less. Used - Shoes are pre-owned and in good condition. May have light wear and may not include the box. New never worn Asos Tan Studded Faux Suede Ankle strapped shoes. Shoe size says 8, this is not a US Womens size 8. These pair of shoes are closer to a US Womens size11 Wide Width. Thankyou For Shopping! It features round toes with sparkly gold dust and a sparkly strip at the back. tan upper, arch support insoles and flat heels. Dress & Formal. Fashion Sneakers. Toe Style: Closed Toe. Heel Height: 0.75. Heel Type: Block. Style: Classic Pump. Material: Leather. Sole Material: Leather. Beautiful leather brown shoes in excellent condition excellent for walking size 5W. Dress & Formal. Strap Type: Ankle Strap. Style: Ankle Strap. Fashion Sneakers. Toe Style: Open Toe. Closure Type: Hook and Loop. Occasion: Casual. Heel Height: 1. Shoe are in great condition. Poor Pre-Owned Condition: Previously worn apparel with significant visible flaw(s) and/or heavy wear/fade is in Poor condition. condition NOT based on the Sole or Insole condition. How we calculate our Pre Owned shoe size, we use the size chart printed on the shoe if available, if Not we calculate the size using our international size shoe chart mm. Style: 1017611. Color: BLACK. Height Including Heels Width Insole Length. Is this item authentic - Yes. These sandals are lovely. White Faux Leather. Lace up the front. Small wedge heel. KEDS Ladies Classic Champion Sneakers, in RED, size 9 WIDE, NEW with box, tried on, never worn. Apparently I am no longer 8.5M with a tapered toe. Dress & Formal. Fashion Sneakers. Toe Style: Closed Toe. Occasion: Casual. Heel Height: 2. Heel Type: Cuban. Style: Classic Pump. These shoes typically show a little more wear in their soles and may have blemishes such as scuffs and/ or wrinkles. 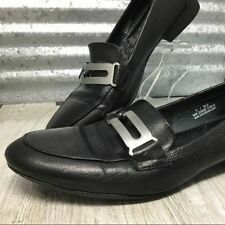 This sale is for a very gentle worn pair of Easy Spirit Fitness Black Leather Slip-ons, size 8W. Slight wear on the soles. Original box included. Leather uppers, man-made soles and linings. Fashion Sneakers. Toe Style: Closed Toe. Save up to 90% on the. Heel Height: 0.75. Heel Type: Block. Style: Classic Pump. Material: Leather. Sole Material: Leather. Style: Mules. Toe Style: Pointed Toe. Dress & Formal. Fashion Sneakers. Save up to 90% on the. Heel Height: 0.75. Heel Type: None. These shoes typically show a little more wear in their soles and may have blemishes such as scuffs and/ or wrinkles. Style: Sandals. Pattern: Solid. Color: White. Occasion: Casual. Width: Wide. They were a gift and they didn't fit, so I decided to sell them.